Thrust bearings are available mainly in two types, such as single and double thrust. 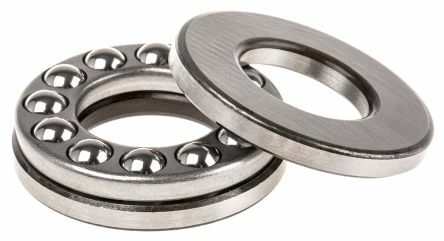 Single thrust bearings consists of two rings and a set of balls in a retainer. Double thrust bearings consist of one rotating ring in the middle with two ball tracks, two sets of balls in a retainer and two stationary rings. Tracks of balls are ground in such a way that the forces between the balls and tracks are parallel to the axis of the shaft. Single thrust bearings are designed for carrying load in one direction only. Whereas double thrust can take in both directions. But these bearings can never carry any radial loads. On account of the centrifugal forces on the balls , these bearings have a limitation in the speed of outer operation.